By now I’m going to guess several of you know I have a “thing” for snowdrops. It’s a lonely thing since my nearest fellow snowdrop lover lives miles and miles away, but it’s a thing and like all things you just have to deal with it. With that said I will forgive anyone who glosses over this post since not everyone will ‘get’ this thing, and many will not even want to appear as encouraging this thing, but that’s fine. Once the daffodils open I’ll move on and we can again comfortably ignore my little secret until next year. Luckily for you the season is practically over in my garden (so this will not drag on for the weeks which it normally does) and here’s only just the briefest summary of a few of my favorites from this year’s snowdrop season. We will begin with a new one, ‘Daphne’s Scissors’, which came via Carolyn’s Shade Gardens last spring. 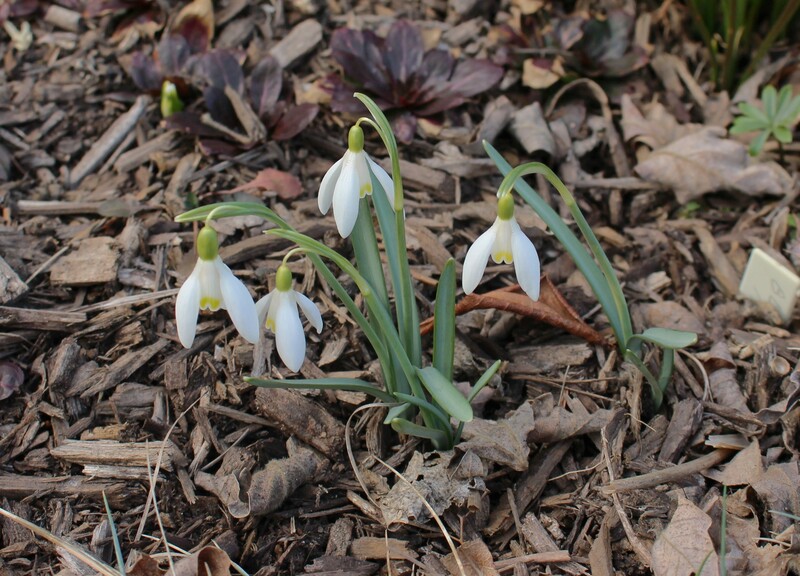 Galanthus ‘Daphnes Scissors’, an early bloomer with me and early enough to open at the same time as the winter aconite (Eranthis Hyemalis). ‘Blonde Inge’ sometimes gives trouble as far as her blonde highlights go, but this year there’s a nice touch of yellow to the insides of her flowers. This is her third year in the garden and she seems to be settling in nicely. Galanthus ‘Blonde Inge’, the covergirl for Naomi Slade’s great little book “The Plant Lover’s Guide to Snowdrops” which I had the pleasure of reading this winter. 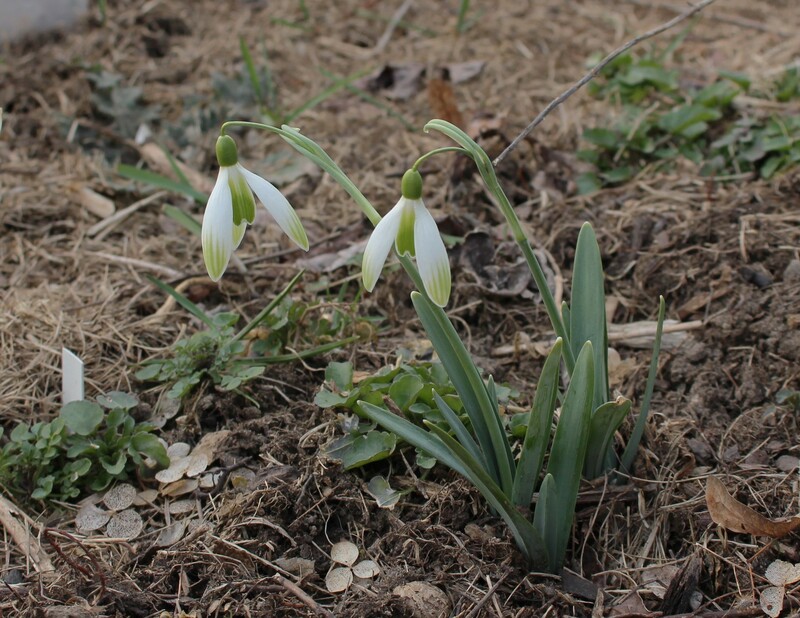 Galanthus ‘MoretonMills’ was the first expensive snowdrop I splurged on. I won’t say how much I paid but it was a ridiculous amount for such a tiny little thing and each spring I hold my breath until it sprouts. Fortunately it’s one of my favorites and is also beginning to multiply. 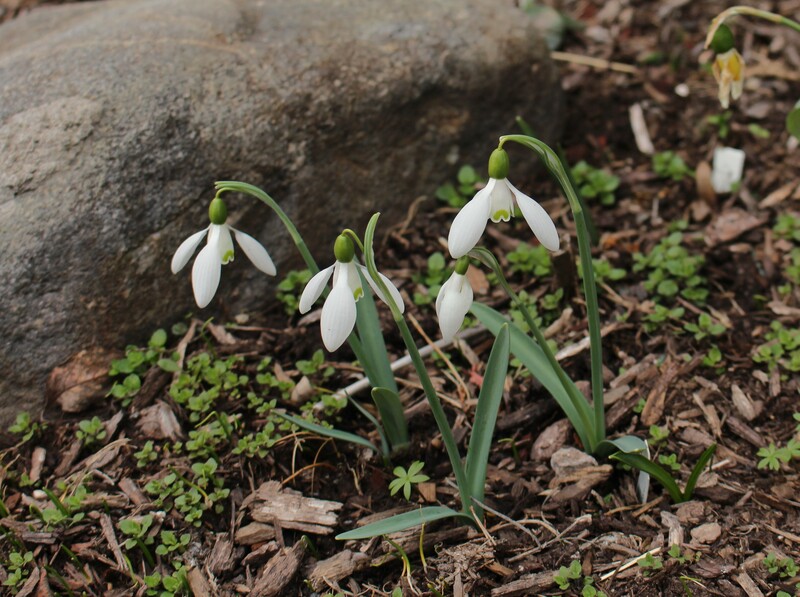 Galanthus ‘Moreton Mills’, a poculiform snowdrop where the three inner petals are as long as the three outer petals. If this plant breaks the four inch barrier I’d call it a growth spurt. Another of my very favorites is ‘Primrose Warburg’. It’s been doing very well here and is actually becoming what I could optimistically call a clump. The downside to collecting unusual little bulbs is that you must often start with just one and to be completely honest a single snowdrop, no matter how special, does not exactly put on a major show in the garden. I’ll leave you with my lovely little golden snowdrop patch, and repeat that the snowdrop season is essentially over here. 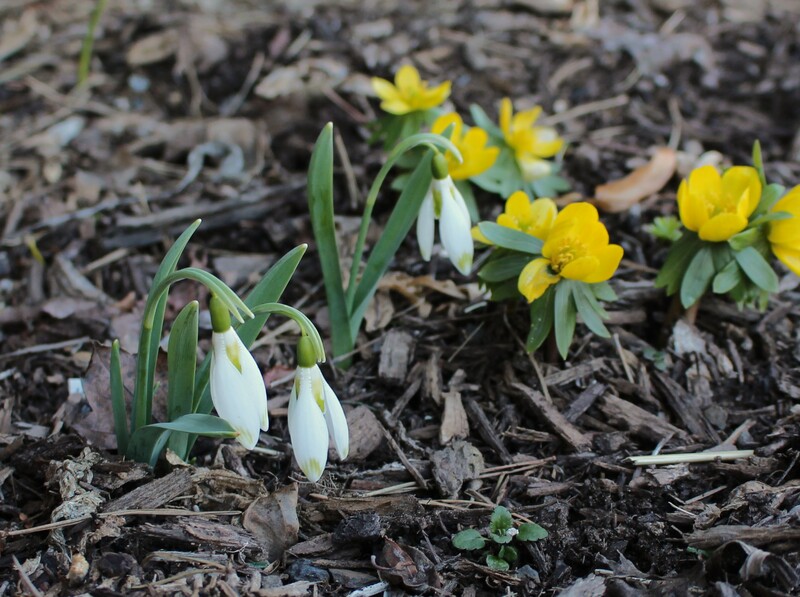 It was a weird one, and for me it was a lame one with harsh late freezes damaging many of the blooms followed by a warm couple days which wilted the rest. 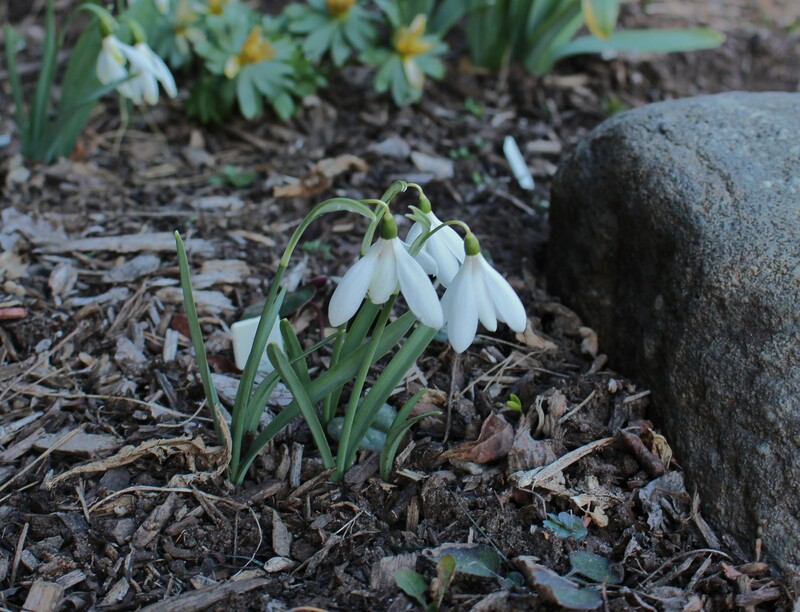 Add a few days out of town for work and snowdrops which came up before my schedule allowed me to fully admire them…. well enough said. At least I was able to enjoy a few crocus. All the crocus came up nicely in the meadow garden and even the rabbits couldn’t keep up with them all. Luckily mother nature and global warming stepped in and wiped them all out with back to back hailstorms. Oh El Nino, you’re really having your fun this year. 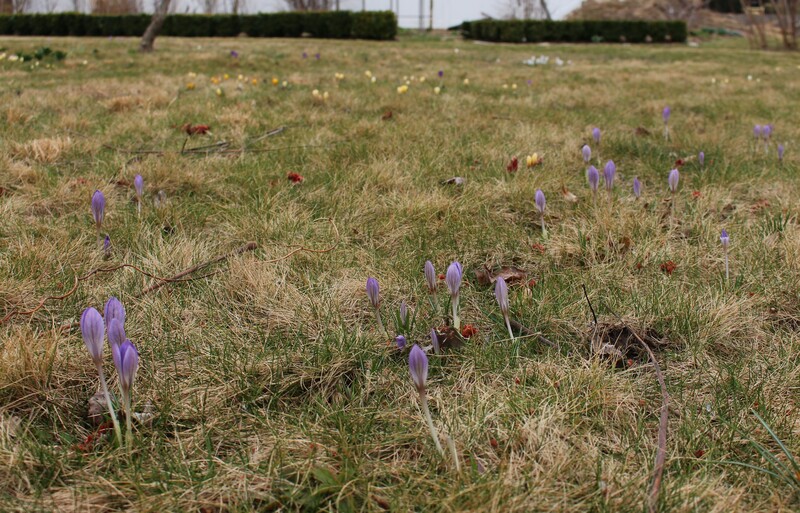 The crocus season felt like it lasted three days. They burst up and bloomed and then the weather did them in. 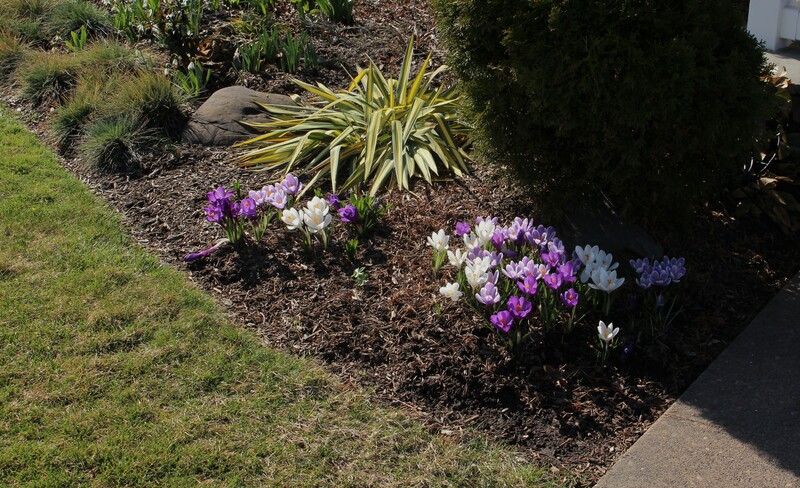 A few of those fat hybrid Dutch crocus growing by the front steps. To get really nice clumps it helps to dig them up and spread them around every three of four years. Forgetting where they are and accidently digging them up in June is my method of choice. Fortunately there’s still plenty of spring left since it’s only just the end of March. A cold spell last week slowed everything right back down, but the first weeks of April look remarkably mild and I’m sure there will be plenty of things sprouting up and blooming and helping me ease my snowdrop hangover. Don’t get your hopes up too much though, I did visit another snowdrop garden last weekend and have one more white and green post yet to come. If I don’t speak with you before Sunday, have a great Easter! This entry was posted in early spring, late winter, meadow garden, snowdrops, spring bulbs and tagged galanthus, snowdrops, spring, spring flowers. Thanks John, and you as well. Snowdrops! So underrated. Those cheery nodding heads are just the thing to get us in the mood for spring! Great post! My snowdrop collection is rather limited as to number of cultivars, and so far I have not felt compelled to splurge on any. But I am going to bookmark this post because if I do start splurging, I really like the ones you’ve featured in this post. It is the season for splurging so maybe there will be something else to tempt you this spring. As we both know snowdrops can cost a bit, but I like to think I have few other vices (if you ignore my general laziness) so a few snowdrop splurges might fall under the category of ‘living it up a little’… or at least that’s what I tell myself! I hope your bloodroot isn’t showing yet. No signs of the one you gave me and I’m starting to get nervous. A very happy Easter to you Frank, least said about your addiction the better; but suffice to say that I think it quite harmless! A very joyous Easter to you as well! Who calls a snowdrop ‘Daphne’s Scissors’? She’s pretty though, as is ‘Blonde Inge’. Some of the names are a bit of a stretch. I think the “Daphne’s scissor’s” was supposed to reference the scissor shaped marking inside the bloom but I think Daphne could have done better. 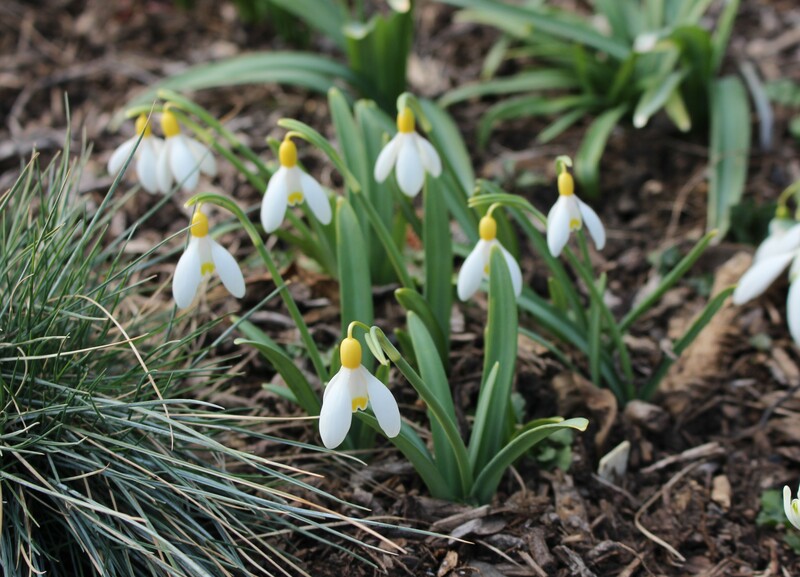 You’re right, Galanthus ‘Primrose Warburg’ does stand out. Love the way the crocus meadow is developing. Hope the weather settles down for you. The crocus probably hit their peak the minute I left home and faded right before I came back. Sometimes I think my garden enjoys being a little spiteful. Thanks for sharing some of your beauties. I may not be an addict, but it is still lovely to see all the different variations, especially those with a distinct yellow tinge. Have a great Easter weekend! Lovely to see your snowdrops Frank. I am cured of white fever until next winter, ( well autumn actually, when reginae- olgae blooms.) Anyway it is lovely to see you are still enjoying your treasures. I am in remission until next autumn as well. A friend generously shared a few fall blooming elwesii with me and to be honest our fall weather is far more forgiving, so I’m looking forward to seeing these bloom!